Former Army Ranger Jagger Baird thought he had his hands full with The Tribe—the band of immortal vigilantes fighting to regain God’s grace by killing those opposed to Him. But that was before he encountered the ruthless group of immortals known as The Clan. The Clan is after a prize that would give them unimaginable power—a piece of the Ten Commandments known as the Judgment Stone. Robert Liparulo’s novels, Comes a Horseman, Germ, Deadfall and Deadlock have received rave reviews, and his short story “Kill Zone” is included in the anthology Thriller, edited by James Patterson. 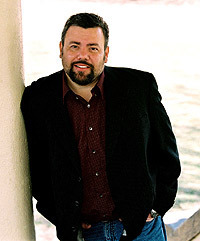 He is also the author of the best-selling young adult series DREAMHOUSE KINGS: House of Dark Shadows,Watcher in the Woods, Gatekeepers, Timescape, Whirlwind, and Frenzy. Robert lives in Colorado with his wife, Jodi, and their four children. It was bad enough having to fight The Tribe, but now Jagger must contend with The Clan, a separate group of immortals who are ruthless killers. While the Tribe kills because they believe they are doing God’s will, the Clan kills and maims for fun. After the Judgment Stone is discovered at the monastery, they are determined to have it and will kill to get it. The Stone, a remnant of the stone on which the Ten Commandments were inscribed, gives the holder the ability to see the spiritual warfare going on around them. With the ability to see the blue thread of light that signals believers who are communicating with God, the Clan formulates a plan to locate those with the closest relationship with God and kill them. Jagger must keep the Stone from the Clan while protecting his family from the Tribe. The Judgment Stone is the sequel to The 13th Tribe, in which we met Jagger, Beth, and Tyler. Jagger is an immortal from The Tribe, although he has no memory of the centuries before he met and married Beth. This sequel is not a stand-alone novel. The back story is referred to only briefly, and not in detail. The premise of seeing angels and demons is not a new one, but the author has used a fresh approach. It was particularly interesting that the believers found the demons to be frightening and repulsive, while the Clan saw them as attractive. One negative: In my opinion, the novel could have been shortened by approximately a third. The first third of the book was very good, but the middle of the book seemed to drag. But suddenly the plot picked up once more, and my attention was caught again. In fact, I hated to see it end. I’m guessing by the ending that there will be a future installment in this series. Anyone who enjoys the works of Frank Peretti and/or Ted Dekker should enjoy this series. This entry was posted in Uncategorized on August 3, 2013 by theselftaughtcook.